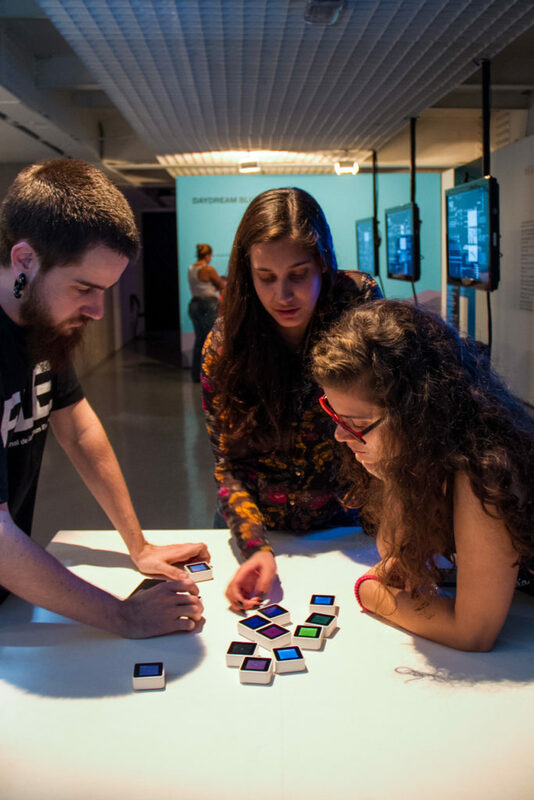 “Colorigins” is a tactile color mixing and matching game designed and developed for the Sifteo Cubes tangible computing platform. By physically manipulating a set of Sifteo Cubes, players attempt to match a target color by mixing a provided set of source colors. Throughout the process of color mixing, players can gain experience with key color theory concepts such as value, saturation, tints, shades, tones, complements, chromatic neutrals, and the relative visual strengths of particular colors. Instead of using primary component values to calculate a color mixture, “Colorigins” uses spectral reflectance values. As visible light consists of a spectrum of wavelengths, any subtractive color can be represented by a series of data values that indicate the amount of light reflected at any particular wavelength. The source colors for “Colorigins” are based on a palette of Munsell Color System colors for which a data set of spectral reflectance values has been determined experimentally. The palette selection was made to maximize color saturation (as saturation invariably decreases upon mixture) while maintaining equal color value, as well as to ensure a perceptually familiar hue gradation. Brad Tober is a designer, educator, and researcher whose work explores the potential of emerging digital, code-based, and interactive visual communication technologies, with the objective of identifying and investigating their relationships to design practice and pedagogy. His practice-led research entity, the Experimental Interface Lab, is characterized by a speculative approach to design (a manifestation of pure research) that recognizes that forms of and methodologies for contemporary practice that spans design and technology are best developed through fundamentally flexible and exploratory processes. Brad holds an MDes from York University (Toronto, Canada), a BFA in graphic design from the Savannah College of Art and Design (Georgia, USA), and a BA in mathematics from the University at Buffalo (New York, USA).